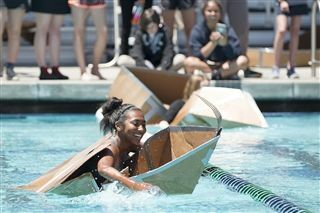 Cheers could be heard all throughout Alga Norte Community Park as geometry students put their cardboard boats to the test on May 8. 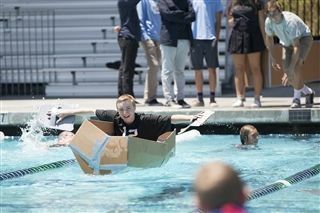 The goal of the regatta was to get in as many laps as possible in a cardboard boat. Geometry students created a prototype and built their boats out of nothing but cardboard and duct tape. They applied concepts such as surface area and it's relation to volume to have the best chance of staying afloat. Some managed more than 10 laps while others barely made it inches past their launch site! A handful of students made oars and paddles (out of cardboard and duct tape of course) to help them get in more laps before their boat inevitably sank.